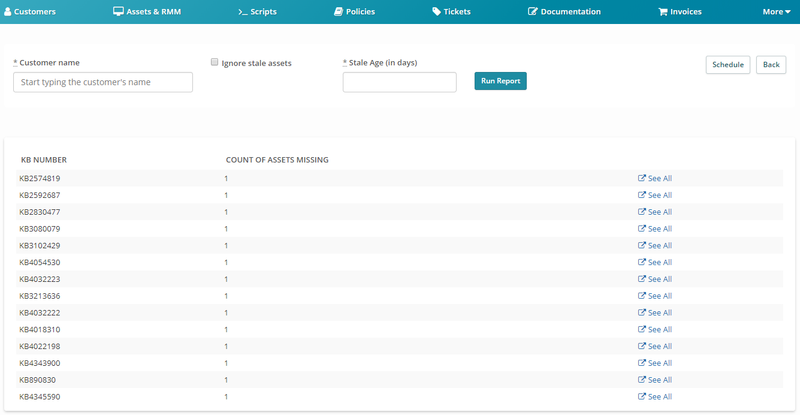 Create saved asset searches to find devices that are missing specific updates, and have installed specific updates. -Note: That downloads of the updates will continue on the device, but they will not Supported Operating Systems: install. Windows 7: Our registry changes disable Windows auto-updating and block Windows Update settings changing from the Control Panel (the user gets “Some settings are managed by your system administrator.” message) when he tries to change the settings in the Control Panel. Windows 8.1, Windows Server 2008 R2: Our registry changes disable Windows auto-updating and block Windows Update settings changing from the Control Panel (the user gets “Some settings are managed by your system administrator.” message) when he tries to change the settings in the Control Panel. Windows 10 Home: Our registry changes will not affect this Windows edition. First, head over to “Policies” and click the “Policy Modules” dropdown to select “Windows Updates”. Here, you’ll see a couple starting templates to give you an idea of what you can do. You can edit, delete, or use them yourself. You can also create your own from one of our examples as a template, or make a brand new Windows Update Management Policy from scratch. Click “+ New Windows Update Management Policy” to create a new policy. Here, you can give it a name, edit the update schedule, and choose whether to run the updates on next boot if the device is offline during the update window. 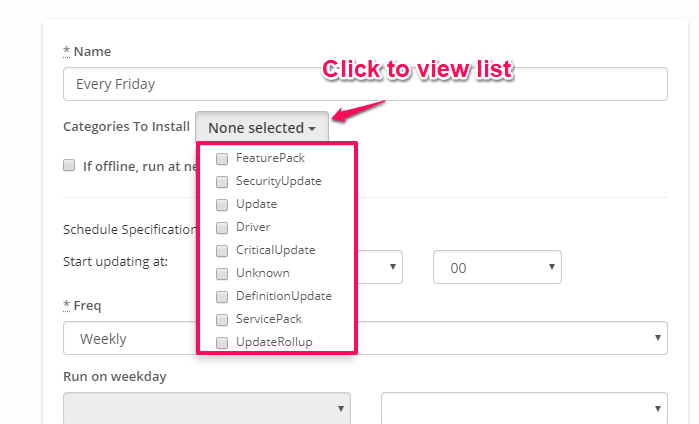 There is a category list drop down that you can click to tell the Policy what Update categories are ok to install. Start updating at - When do you want Windows Updates to begin? Minutes are set for 00, 15, 30, and 45. Freq - How often do you want to run Windows Updates? 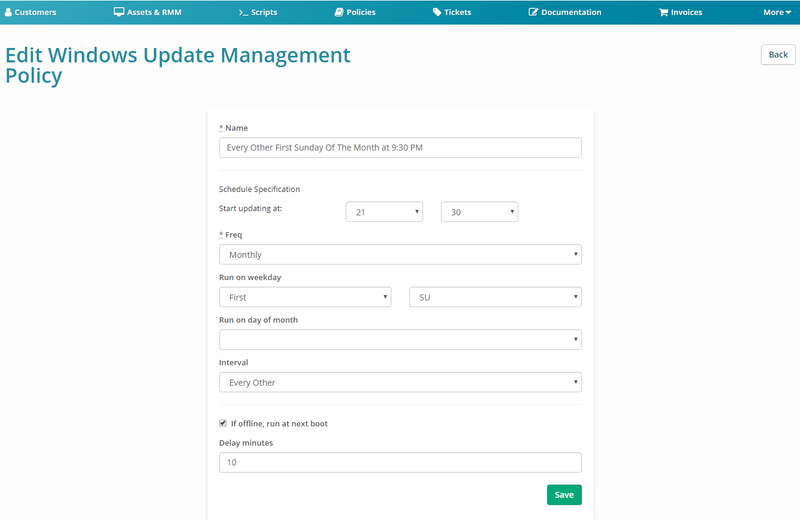 Run on weekday - Do you want to run updates on a specific day of the week? If you chose “Monthly” as your frequency, you can choose to run updates on the First, Second, Third, Fourth, or Last chosen weekday of the month. Run on day of month - Do you want to run updates on a certain date? Only available to “Monthly”, and lets you choose a date from 1-31. If you choose 31, it will always run on the last day of the month. Interval - Do you want to skip a Windows Update frequency? If offline, run at next boot - Do you want this to run when the device starts if it missed the update window? Here is an example Windows Update Management Policy that is set to run every other first Sunday of the month, starting at 9:30 PM. If the device is offline at 9:30 PM, run when it boots next after a 10 minute delay. Once you click “Save”, you are all ready to apply this to a device policy! 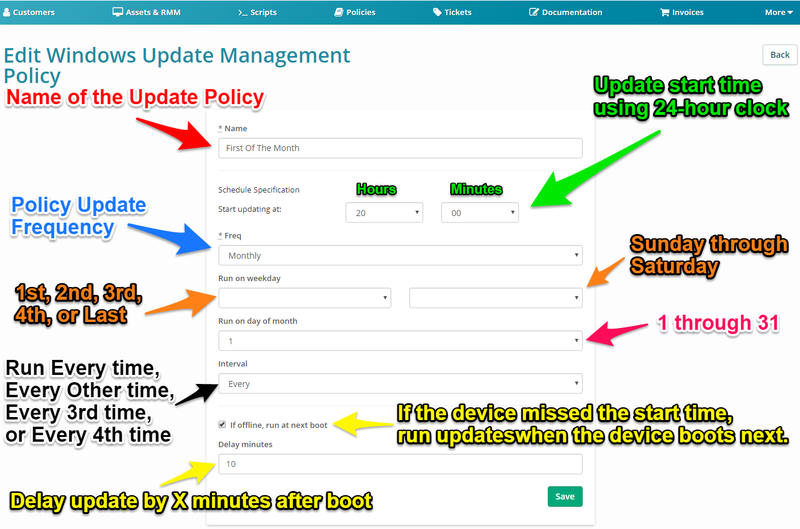 Now that you have your Windows Update Management Policies created, you are ready to apply them to your Asset RMM Policies to get your devices up to date! Head over to “Policies” to view all your asset RMM policies. Click on any to edit them, and scroll down to “Windows Updates” to select any of your Windows Update Policies that you created before. You can also click on the “here” link to edit and create Windows Update Management Policies should you need to make any changes. Just make sure to save your Asset RMM Policy once you are done! Now that you have your Windows Updates scheduled, it is time to view the current status of Windows Updates on a device. Head to “Assets & RMM” and click on a Windows Device to view its details. You should now see a “Windows Patches” tab to view the device’s current Windows Patch status. 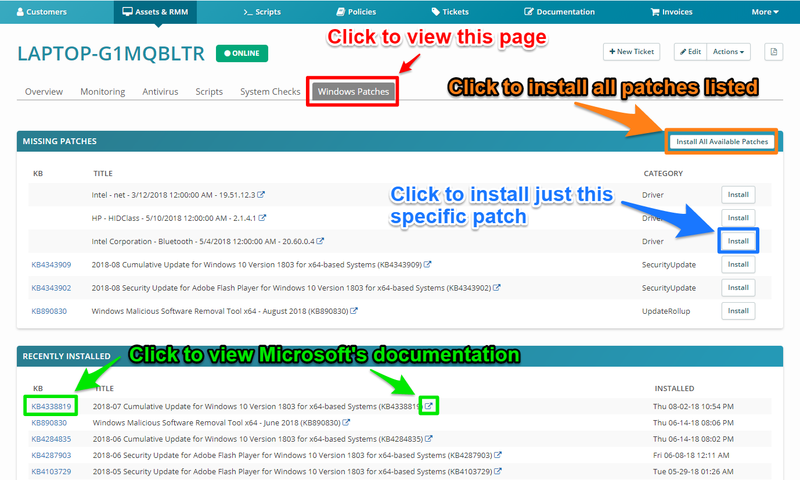 You can view the KB number of the patch, and clicking on this number will direct you to Microsoft’s documentation on the update for more information. The missing patches section will allow you to “Install All Available Patches” shown in the list, or you can use the “Install” button next to the missing patch to install them individually. Either install option will push the update in real-time, and you can watch the patch’s install progress on the “Scripts” tab on the device. If the device is offline, it will push it when it comes back online, just like if it were script. With the inclusion of Windows Updates Management in Syncro, we decided you would need additional reporting to go along with it. We’ve added two new reports (Vulnerable Systems and Vulnerable Patches), and updated two older reports to include this new information (Customer RMM and Executive Summary). 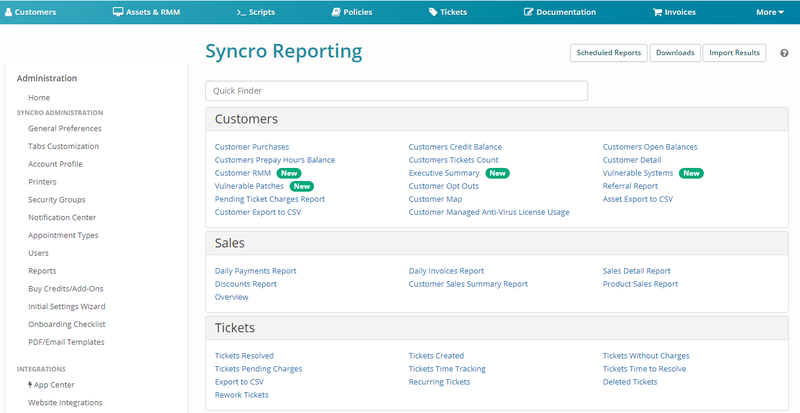 You can find these reports under the “Customers” section in your Reports (marked with a green “New” tag). This report will show you your assets that are missing the most patches. You can filter the report to a certain customer, ignore new patches, and ignore assets that have not been online in the last “X” amount of days (where X is any number of days you would like). You can also schedule this report to run as often as you would like to keep a CSV history emailed to any email address you would like. This report shows you the Windows Updates that are missing on the most devices, and gives you a count and list of which devices are missing each update. You can filter the list by customer, and ignore assets that have not been online in “X” amount of days. This report now includes a new section at the bottom that details the percentage of devices that are completely up to date, and how many updates that have been installed during the date range for that customer’s devices. There is also a list of devices for the customer that have updates pending that are over a week old. This report also includes the new bottom section that details the percentage of devices that are completely up to date, and how many updates that have been installed during the date range for that customer’s devices. The asset saved search has also been improved, and now allows you to search devices for missing Windows Updates, and installed Windows Updates to make finding the assets you need that much easier. Please let us know so we can help add troubleshooting steps for new users to come!